The Los Angeles Chargers are now tied for the best record in the division after their 19-10 victory over the Cleveland Browns in the StubHub Center. RB Melvin Gordon had 19 carries for 77 yards and added another 29 yards on receptions. However, once again it was the QB Philip Rivers – WR Keenan Allen show. The pair combined for 10 receptions, 105 yards and a touchdown. Rivers threw for a total of 344 yards on the day. QB DeShone Kizer had two turnovers, both late as the rookie was trying to make a play to keep Cleveland in the game late. RB Isaiah Crowell had 41 yards on 10 carries, but the Browns were forced away from him due to game flow. Edge defender Joey Bosa essentially ended the game with a strip sack of Kizer late in the fourth quarter. LB Denzel Perryman recovered and the Chargers did not leave Cleveland with enough time to make a come back attempt. With that, we give you our PFF-exclusive takeaways from the contest for each team. Hunter Henry found success against the Browns linebackers throughout the day in the passing game, coming up with seven catches on eight targets for 81 yards and which led to a passer rating of 108.9 when thrown at. Henry caught five of his six passes while working against linebackers Christian Kirksey and Joe Schobert, he also helped to open running lanes in the ground game which led to a run-block grade of 81.5. The Chargers quarterback has enjoyed a nice string of success the past three games, throwing for six touchdowns and no interceptions while compiling over 1,000 passing yards over that span. Rivers enjoyed a clean pocket throughout most of the game and made the most of it, going 28-of-35 for 304 yards and a touchdown from a clean pocket. Rivers was also able to find success throwing the ball downfield, going 11-of-20 for 192 yards while throwing the ball beyond 10 yards in the air. The Chargers will need Rivers to continue to play at a high level as they make a push for the AFC West title. 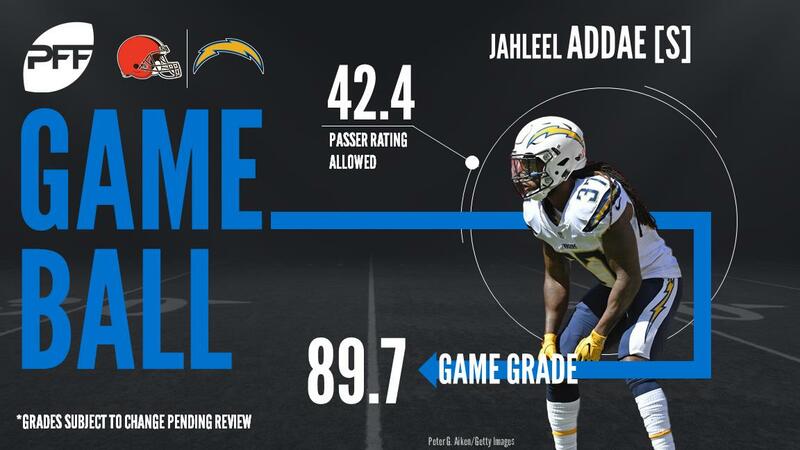 Addae had a great game in coverage, flying all around the field to make plays. He was targeted six times and allowed just two catches for 15 yards while also making a great pass defense. Two of the other incompletions were direct results from his tight coverage. For good measure, Addae blitzed once in the game and recorded a pressure on that rush. Bosa has been dominating tackles all season and this game was no different. He finished with three hurries rushing the passer, as well as the strip sack that essentially sealed the victory. His pass-rush grade of 84.5 led either team. Bosa also had a solid 78.3 run-defense grade thanks largely in part to the three solo run stops that he made. What Gordon did in this game was pretty special and speaks to the level of talent he has a player. Despite this being his first NFL game in 1,078 days, despite being shadowed by PFF’s highest-graded corner in Casey Hayward, Gordon still made four big catches for 85 yards and forced a missed tackle. He averaged 2.83 yards per route run for the game and still looked to be getting used to the NFL speed again. A week after turning in a career-best performance, Kizer played his worst game as a pro thus far. He had an adjusted completion percentage of 46.7 percent and completed just four deep passes on 12 attempts (only a seam route to Njoku was a particularly good throw). He really struggled under pressure, completing just one of nine passes. Kizer’s awareness was in question late in the game, when he didn’t throw the ball away in Chargers’ territory and was strip sacked. Then on the next drive he took a terrible sack that cost his team close to 30 seconds, and followed it up with a bad interception. Kizer is capable of big games but he was extremely erratic in this one. The second-year corner out of Minnesota earned the highest grade on a Browns defense that struggled to limit big plays and come up with timely stops when needed. Boddy-Calhoun was targeted five times, allowing three catches for 35 yards but was able to limit Keenan Allen to only one catch for two yards while covering him. CB Jason McCourty was lined up against Allen for most of the game, and came away second-best, allowing seven catches on 10 targets for 94 yards and a touchdown. The Cleveland defensive front struggled to generate a consistent pass-rush against the Chargers, pressuring Rivers on only nine occasions. Ogunjobi was unable to generate pressure but played an important role in limiting the Chargers to less than four yards per carry on the ground, compiling two stops on 10 run snaps. Ogunjobi has been a pleasant surprise for the Browns, recording 10 total run stops on limited snaps his rookie year.